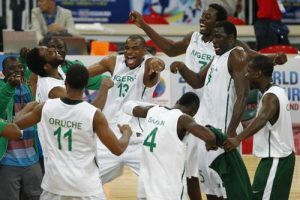 Nigeria’s AfroBasket male title defence gained momentum on Saturday in Tunisia when the D’Tigers beat Mali 90-67 points in their second Group A match. The senior men basketball team had narrowly beaten Cote d’Ivoire 78-77 points in their first group match on Friday. Nigeria beat Mali 20-16 in the first quarter, ended the second quarter leading 39-33, and maintained the dominance by leading 66-51 by the end of the third quarter. Ikenna Iroegbu, Nigeria’s point guard with Washington St in the famous National Basketball Association (NBA) in U.S., emerged the best performer for D’Tigers in the game. He scored 18 points, nine rebounds, five assists and one steal. Similarly, Ikechukwu Nwamu contributed 22 points, while Ayodeji Akindele, another U.S.-based player, had 10 rebounds, three blocks and scored four points to humble Mali. However, Ibrahim Djambo of Mali who scored 24 points, seven rebounds and two steals to emerge top performer for his side. Nigeria will now face DR Congo on Sunday in their last Group A match. D’Tigers are the competition’s defending champions, having won the last edition in 2015, while their female counterparts D’Tigress are champions of the 2017 Women’s AfroBasket.